2019 is going to provide many movies to Punjabi industry and this will be a great year for Punjabi cinema as well because of its growing relations with Bollywood and along with the level and standard of cinema is rising day by day. 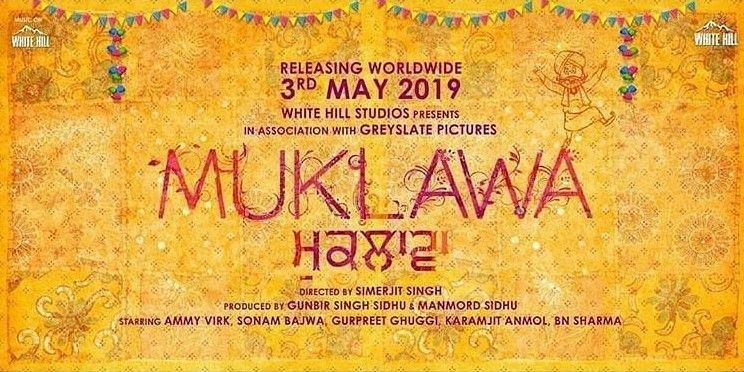 Now we have another film coming this year which is named as Muklawa and starring Ammy Virk along with Sonam Bajwa in lead roles. Stars like BN Sharma, Gurpreet Ghughi will also be part of the film. Muklawa movie is produced by White Hill Studios and associate producers of the film are Grey slate Pictures. The film will be directed by the very famous director of Punjabi industry, Simerjit Singh who started his career from Bollywood film 1998 Pyar To Hona Hi Tha as an assistant director while he directed many Punjabi films like Baaz, Angrej, Nikka Zaildar both parts, Subedar Joginder Singh, Mar Gye Oye Loko and many more. Most of the films he directed are some of the super hits of all the times. Ammy Virk will be leading the film and we know that he is a famous singer of Punjabi music industry and now has been loved by the audience as an actor as well. He has always been very dedicated and honest to his work. Recently he did a biopic of Harjeet Singh, junior hockey team caption of India and his work hard work was clearly visible for the film as he prepared himself to look like of 17 years old youngster by losing 14 kg of his weight. He is well-known for his work in films like Bambukat, Nikka Zaildar, Harjeeta, Angrej and many more. Sonam Bajwa is a beautiful actress of Punjabi film industry and she has been part of many movies which have made us laugh, emotional, think about society and have been an inspiration in many ways. She is known for her work in films like Punjab 1984, Nikka Zaildar one and Nikka Zaildar 2, Best of Luck and many more. Poster of Muklawa has been released but it only contains some of the important names and information related to the film. There is nothing that has actually been released by anyone related to the film but the name itself suggests that the film will be based on a love story between Ammy Virk and Sonam Bajwa but still we cannot be sure about the concept or story of the film. Star Cast: Ammy Virk, Sonam Bajwa, Karamjit Anmol, Gurpreet Ghughi and BN Sharma. Muklawa is set to release on 3rd May 2019.